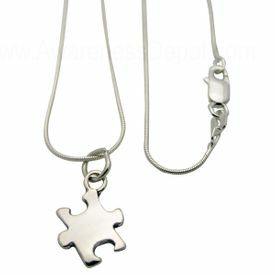 This beautiful sterling silver puzzle piece necklace features our sterling silver puzzle piece on a silver chain. A beautiful way to show your support and it's nice and simple to go with any outfit. Measures 1/2 an inch by 5/8 an inch. 18 inch 1mm Sterling silver snake chain.